Halloa. Wolvenciel here. I... was supposed to cover for this blog since... well, a week ago but I kind of didn't get my mood up even though I have more free time now. So here I am. I'll have to say sorry for people who actually do look forward to this blog. Sorry. P/S: This was supposed to be out two days ago but I got to playing Catherine (a video game. look it up) ... so yeah. Sorry. 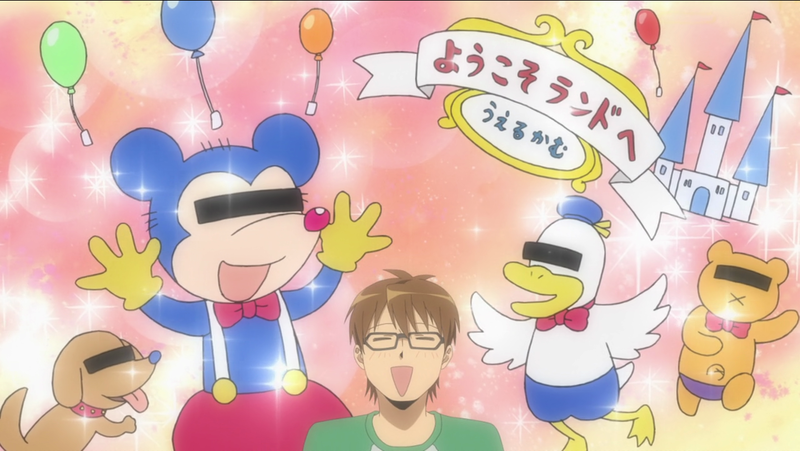 This is the first All-Star anime I've got in line for you people. 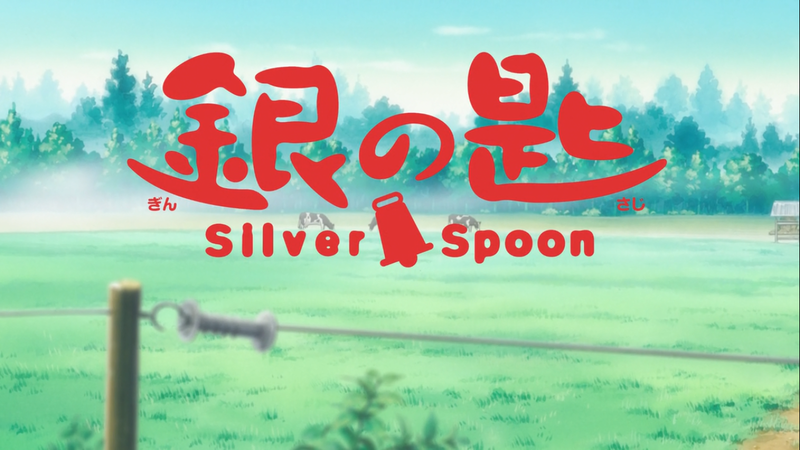 Its Silver Spoon, a very unique, out of the box anime about life in an agricultural school out in the boonies of Ooezo (not that I know where that is). Hachiken Yuugo, ladies and gentleman. The boy, not the pig. 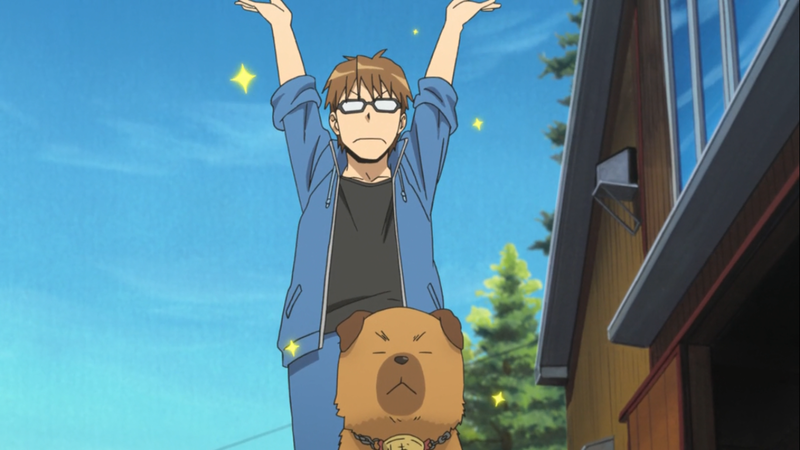 So the anime centers on Hachiken, a city boy from Sapporo oblivious of the agricultural lifestyle and having a lot of first times in his life by attending the school. It focuses on how Hachiken deals differently with issues regarding agriculture both physically and morally as he's the odd one out. 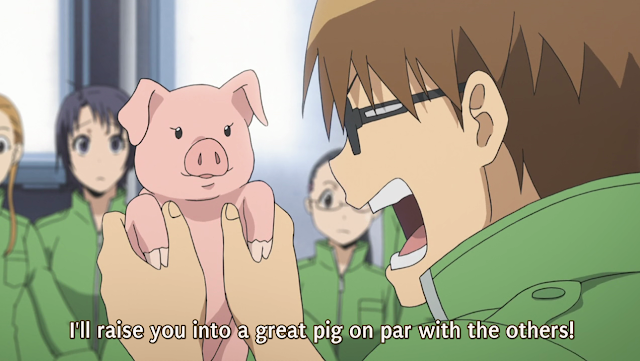 Anime piglets do look cute I guess. 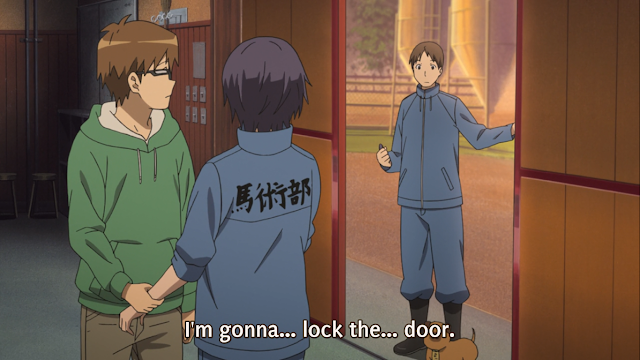 Hachiken is of course the main focus of the anime and let me tell you this first hand, what never fails to crack me up are the various exaggerated reactions he made when he encounters new stuff or when things happen around him. 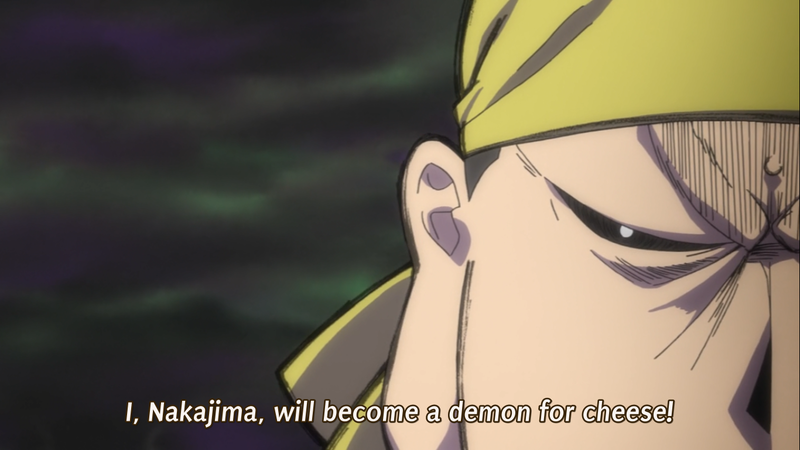 Sure, there are lots of supporting characters that help bring out Hachiken's unique characteristics and by jove I swear each one of them adds so much color to the whole anime. Hell there's even friggin Armstrong* as a cameo in the anime. 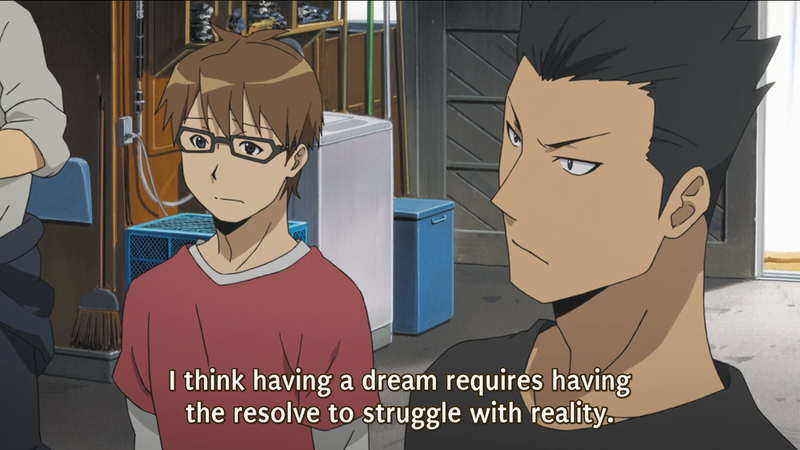 All in all, I have no qualms whatsoever with all the characters in the anime. They were perfect. 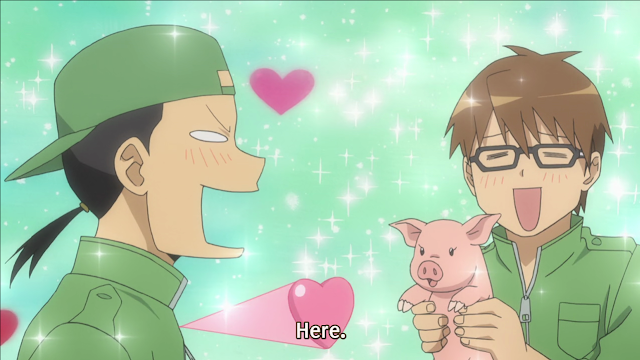 Silver Spoon has two seasons (and I wouldn't mind a third to be honest) and the first season mostly revolves around his fixation on a piglet that's bound for a slaughterhouse in three months. There's a few fillers here and there but ultimately even the fillers contribute to Hachiken's development in figuring out what is best for the piglet that he name Butadon (pork bowl in english). The anime throws these kinds of questions at the viewers. I like that. The second season goes a bit deeper in the emotional department as the anime delves into Hachiken's problem with his father (like even I don't know what his problem is. I do get it though. I've seen cases like him in real life) who's all work and no play. Actually... He's even worse than that. You'll have to see to find out. The second season also expands more on the horse riding scene and a few horse-related philosophies and problems as well. There's also hints of romance in the anime but the ship doesn't sail just yet. There's two way to look at it. First, The anime can be seen as quite light in the sense that it exaggerates a lot of things through Hachiken and make any and all situation fun and interesting. 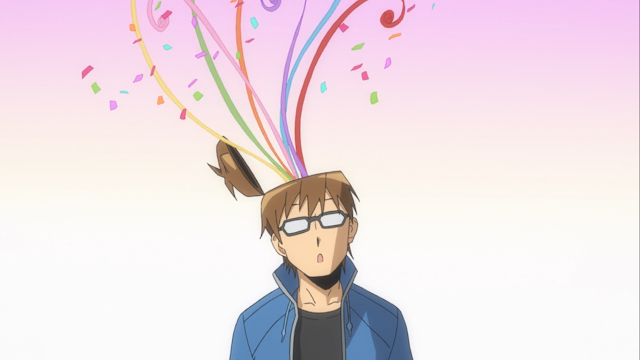 However, it also stimulates viewer into a lot of complicated questions which makes the anime quite heavy. Hachiken's reaction. I don't need to tell you what reference this is. Like a kid could watch the anime and laugh at the various expressions of Hachiken Yuugo but won't understand the woes he's having but a grown up could be too focused on his deep thoughts that they forget to enjoy the anime's fun moments. Well, that may be just me overthinking. The anime weaves in funny bits into serious moments so well that I think it actually did achieve a perfect balance of both worlds. One thing I can say is that the anime was too interesting for me to even care that much about its animation qualities but I didn't notice anything particularly jarring about the whole anime (unless you think slaughtering animals is a weird thing that is). Look at his friggin face. As I've said over and over in the review, the facial expressions in this anime is always on point. Like for every single situation there's bound to be a fitting reaction and expression for it. If any of this makes sense. The anime ends in a very peaceful manner and it kind of leaves me hanging in a sense. 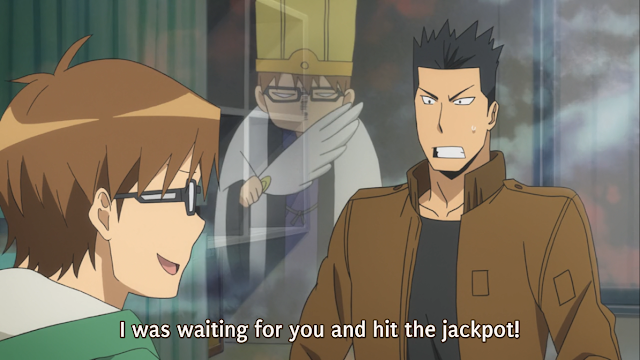 I kind of want to see more Hachiken. I... I want more. Tch. Well. 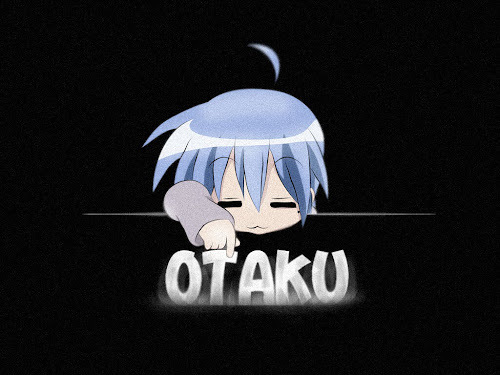 There's always the manga. You can follow the manga. I highly recommend it. If you think the anime isn't enough for you that is. And I assure you, it won't be enough. I highly doubt it. I've had nothing to say but praises upon Silver Spoon and I really do mean everything I just said. Its one of those great animes that you just have no beef with (though the anime itself contains beef, chicken, pork and a lot of other delicious stuff). 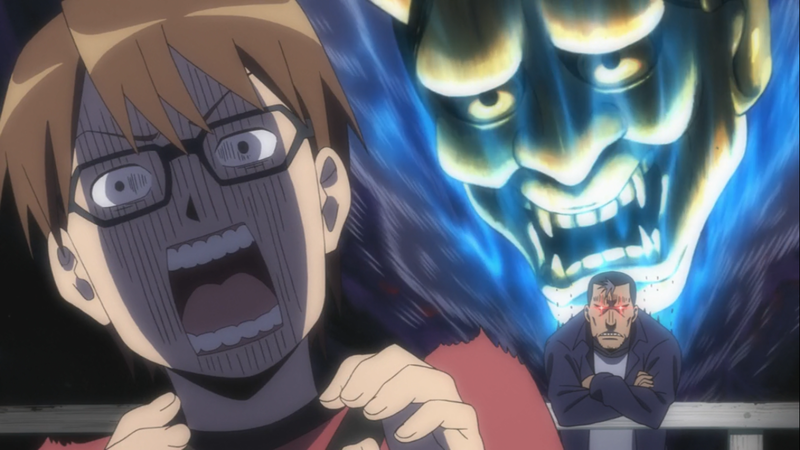 Even more Hachiken reaction. This was a cute episode. As one of my All-Star picks, I hope if you do decide to pick this up, you'll enjoy it so much, you'll watch it again.